Pickup truck buyers in 2017 who are looking for a full-size off-road truck often still consider the Ford SVT Raptor and Toyota Tundra Rock Warrior. Although both these truck models are discontinued as of 2014, they are still favorites among pickup truck enthusiasts in 2017. Both trucks are relatively similar in terms of general specifications, although they also have some significant differences. Areas in which you’ll want to compare the Ford SVT Raptor and Toyota’s Rock Warrior models include the power train, off-road capability, towing performance and body style. The SVT Ford Raptor is a variation of the twelfth-generation Ford F-150, which is a light-duty pickup truck in production from the 2009 to 2014 model years. The Raptor was specifically intended for off-road use. Pricing for the base model was approximately $42,000 in 2010. 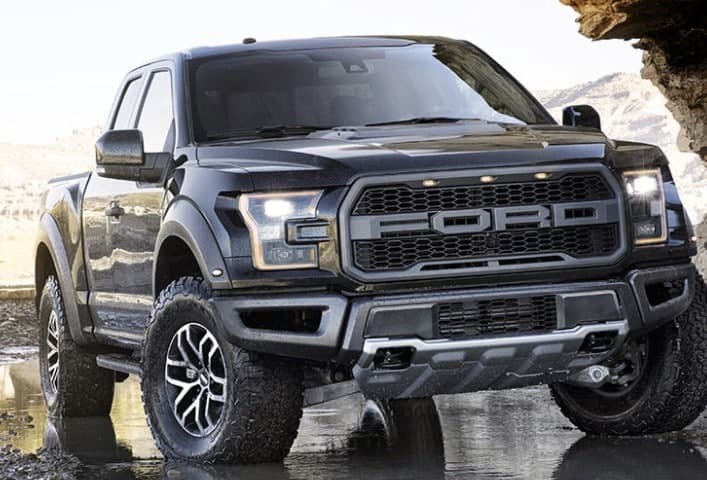 Truck enthusiasts went crazy over the Raptors’ ability to effortlessly maneuver unruly terrain and its major upgrades in horsepower over previous Ford truck models. In 2009, Toyota introduced their version of an off-road themed option package in their pickup truck line, called the TRD Rock Warrior. The Toyota Tundra had been in production since 1999 prior to the release of the Rock Warrior model, with the second generation of Tundra’s debuting in 2007. 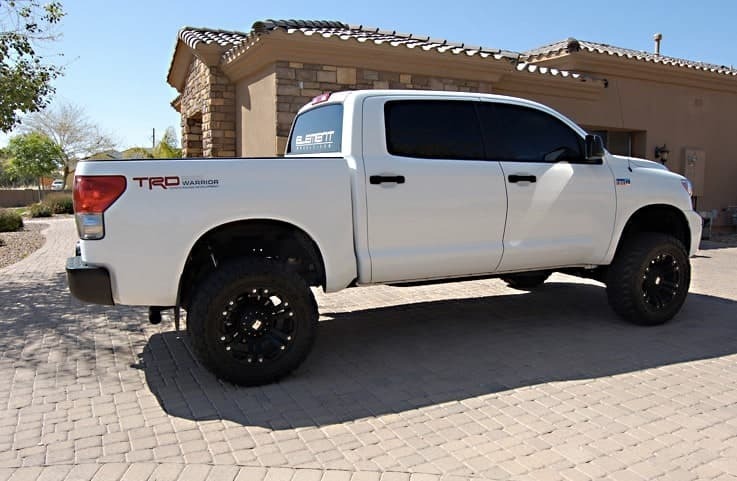 The base price for the 2009 Toyota Tundra Rock Warrior was about $37,000. The standard engine for the 2009 and 2010 Raptor was a 5.4-liter (L) V8 engine generating 310 horsepower (hp) and 365 pound-feet (lb-ft) of torque. A 6.2-L V8 was also available as an option, which generated 411 hp and 434 lb-ft of torque. The 6.2-L engine was the only engine choice for the 2011 to 2014 models. The standard transmission for the Raptor is a six-speed automatic. The suspension system includes Fox Racing Shox shocks with external reservoirs that provide a total of 11 inches of travel in the front and 12 inches in the rear. The gear ratio on the locking differential is 4.1:1, which was originally an open differential. However, a limited slip differential was introduced for the 2012 model year. The Raptor also has an off-road driving mode that disables the anti-lock braking system, roll stability control and traction control. This driving mode also provides a more linear curve for power and torque during conditions with low traction. A six-speed automatic transmission is also standard for the Toyota Tundra, which allows the torque converter to be locked in fifth and sixth years. The 5.7-L engine also has a manual shift mode. Additional driving features of the Rock Warrior include anti-lock brakes, limited-slip differential, stability control and traction control, according to Toyota.com. 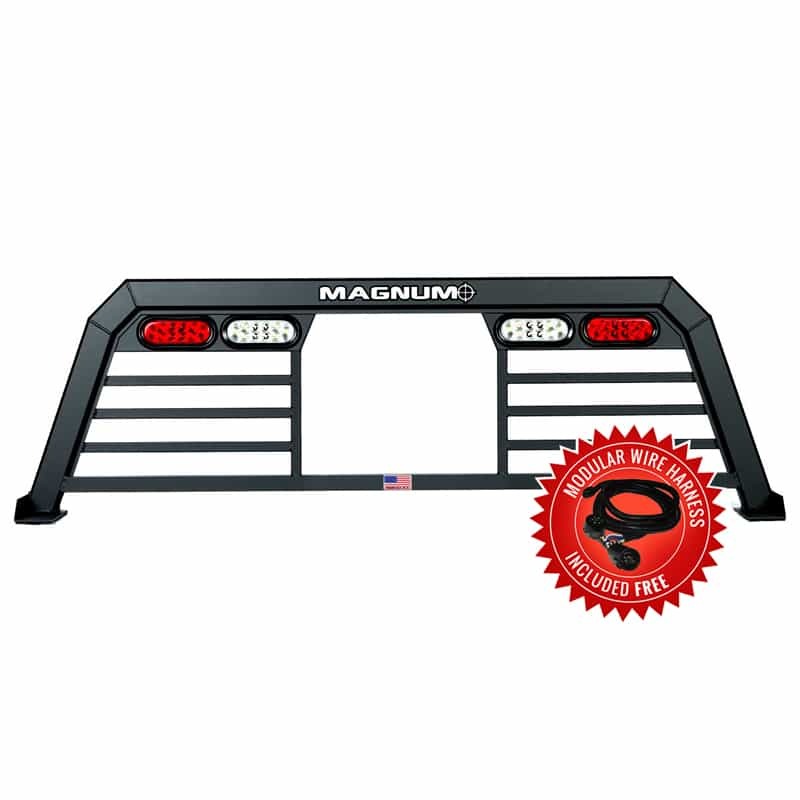 The Rock Warrior model also includes an integrated backup camera display included in either the rear view mirror or available Display Navigation and has a center-console gated shift lever. 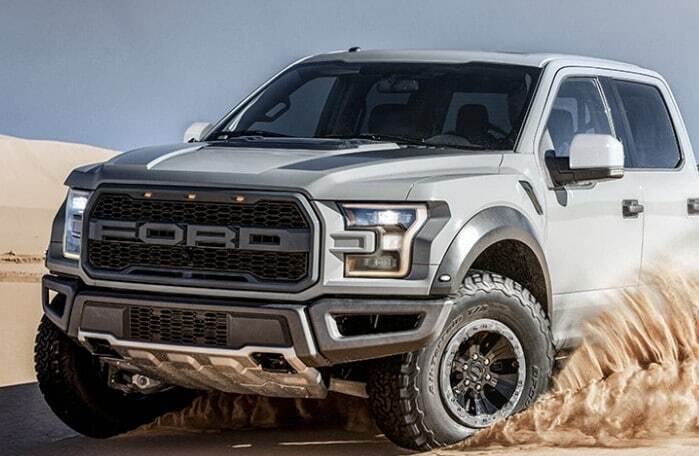 The maximum towing capacity of the Raptor is 8,000 lbs. for the SuperCrew cab, which also has a 1,770-lb. Payload. Additional towing features of the raptor include a special steering wheel and pre-wired pass-through leads that allow trailer lights to be easily connected to the Raptor’s electrical system. Towing is where the Toyota Tundra surpasses the Raptor. 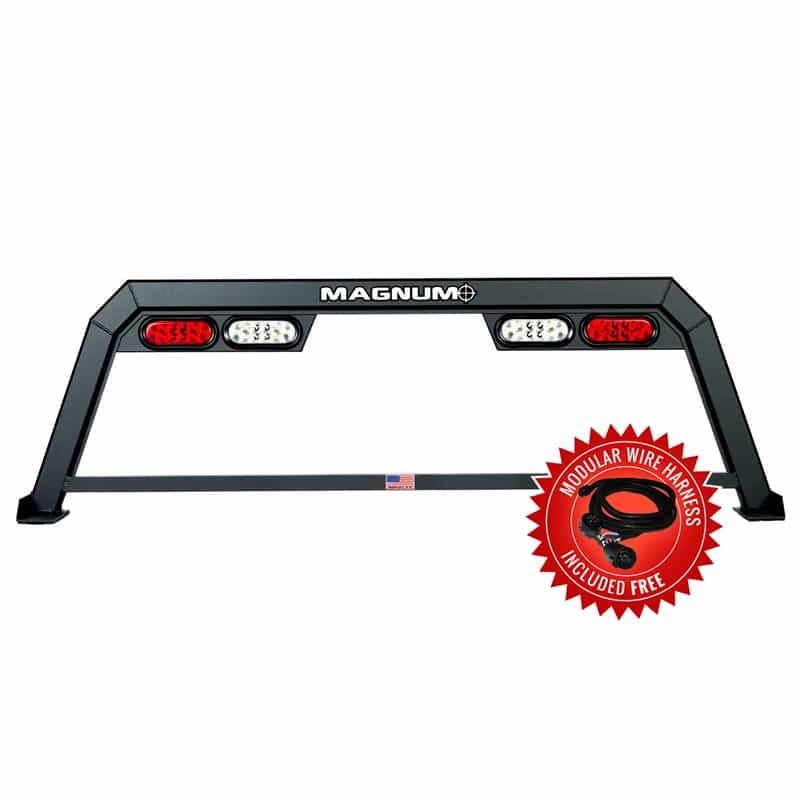 A tow package option is available for the Rock Warrior, which increases its maximum towing capacity to 10,400 lbs. with a payload of over 2,000 lbs. The transmission and rear-axle ratio on the Rock Warrior are also optimized for towing. The body style of the Raptor is noticeably different from that of the standard F-150 SuperCrew cab, especially in front of the A pillar. The hood and fenders are different, and the blue oval badge is missing from the front grille. The Raptor is also two inches taller and seven inches wider than the standard SuperCrew cab, so it requires a custom bed. The performance aspects of the Rock Warrior have remained largely unchanged since its debut, especially the engine and suspension. The ride is therefore noticeably choppy compared to the Raptor. The interior of the Rock Warrior is also unrefined due to the lack of modern features found in the Raptor. However, the towing capacity of a properly configured Rock Warrior significantly exceeds that of the Raptor. One of the most common complaints about Toyota’s Rock Warrior was that the package was “mostly cosmetic” and didn’t offer a lot of meaningful upgrades for Toyota truck drivers. 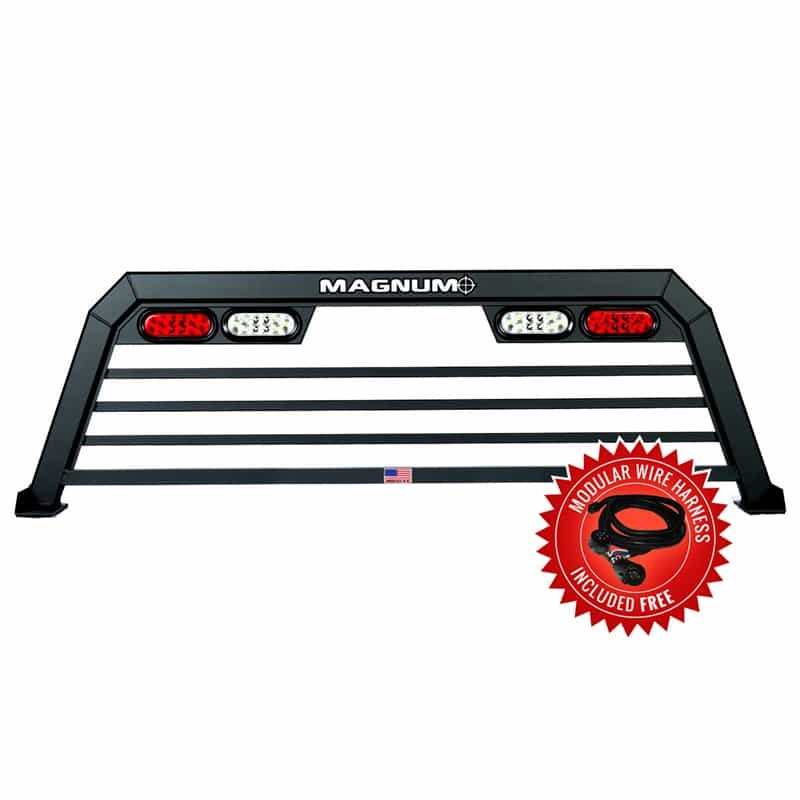 Regardless of which of these models you decide to go with for your next off-road worthy pickup truck, we can help you outfit your truck with the ultimate accessories.